News about audiobooks, talking books, books on tape and other recorded books. Toni Morrison is widely recognized as one of America’s greatest living writers. In 2006, the New York Times Book Review voted her novel Beloved as the best American novel of the past 25 years. Morrison’s remarkable achievements as a storyteller have been recognized by nearly every prestigious award possible including the Nobel Prize for Literature. She has been a pioneering author in countless ways. Yet she has received little credit for one achievement: recording her own audiobooks. Morrison is rare among reputable authors in recording her own books. The earliest audiobook of Morrison’s work that I have come across is a recording of Sula made by Clipper Audio in 1973. Morrison began her own audio career in 1983 with a recording of Tar Baby for the American Audio Prose Library. She went on to record all of her other novels including The Bluest Eye, Sula, Song of Solomon, Beloved, Jazz, Paradise, Love, A Mercy, and Home. These novels have also been recorded by actresses such as Desiree Coleman, Ruby Dee, Lynne Thigpen, and Alfre Woodard. But Morrison’s recordings reveal how the author herself imagined the words on the page to sound. Morrison narrates her audiobooks in the same way as she reads books aloud at public events. Her reading style has not always been as well received as her writing. Some find her speech mesmerizing, even haunting, and embrace it as the novel’s authentic voice. Others struggle with her unique cadences and refusal to perform. Her novels can be challenging to follow by ear owing to their lyricism, abrupt shifts in setting, and overall fragmentation, with little authorial guidance to help the reader follow along. 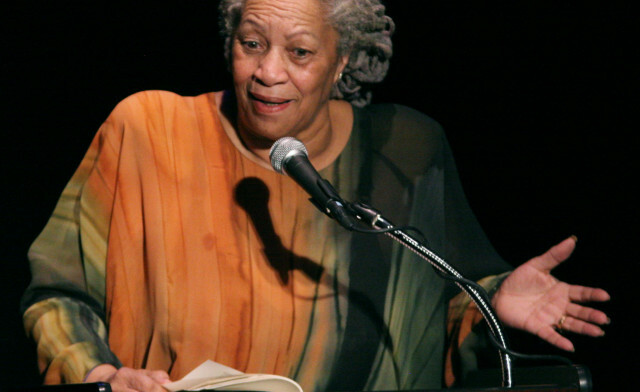 Hearing Toni Morrison read aloud is a very different experience from that of reading her to oneself. Recently I had a chance to speak with Morrison about her audiobooks. Here’s what she had to say about the art of reading books out loud. Matthew Rubery: Many authors don’t record their own audiobooks, especially not in the 1980s and 1990s. What made you decide to do it? Toni Morrison: I listened to one of the audio recordings that had been done by actresses, like Lynne Thigpen and Alfre Woodard, and both of them were first-rate actresses. I listened to Woodard because I like her, and then I noticed that she didn’t — let me see how I can put this — the rhythm was wrong. She didn’t put the emphasis where I had heard it in my mind. So I thought, well, then I’ll read it the way I think it ought to sound. I agreed to do them all, and I think I did everything but — I don’t know if I did Paradise. Since that time I’ve gone over to the studio and sat in that little cell and recorded all the books I wrote with the right emphasis, accent, and so on. When I read the book aloud before audiences, I always read it the same way. So that’s what made me decide. MR: Speaking of putting the intonations in the right places, how would you describe your own reading style? TM: I don’t know how to describe it. One of your questions was about dramatizing character voices. That’s a little too theatrical and staged for me because I don’t want to limit the reader’s view or imagination about the characters. I never describe them in detail either because I want to leave that to the reader’s imagination. But nevertheless, if I think that Beloved opens with a certain rhythm — “124 was spiteful” BOOM dah-du-du-du-du-dah-dah [laughs] — that’s the way I hear it. And why should anybody else? MR: Do you think it makes a difference whether the author or a professional actor reads the book? TM: Well, I’ve heard some authors read and they’re awful. And I’ve heard some authors read and they were wonderful. I heard Bill Styron read some years ago; I couldn’t believe how good he was. Really good. He was reading in public. And I’ve heard Faulkner — horrifying! I mean that beautiful written language, and he’s drawling when he reads. So it depends. Some authors do very, very well when they read their own stuff. But I do know this: a friend of mine, Peter Sellars, has been teaching for years at the University of California, Los Angeles, and he has all of his students listen to The Bluest Eye, my recording, before they read the book, and I have heard people say that after they heard the recording, they understood things better. The recording made a difference in their understanding or intimacy or relationship to the material. MR: Do you have a different relationship to readers of your books than to audiences who are listening to you read? TM: I always think they read it and hear it the way I do — but that’s wrong. I want the reader to help me with the book. I want the relationship to be that intimate. So I have to leave out certain things that the reader can supply. I once had a colleague, a young woman, tell me that her brother died, and she says she had a dream about her brother drowning in a lake, but Pilate, who was a character in Song of Solomon, came and rescued him. It was a very pleasant dream. And I said, “What’s she look like?” So this woman gave me a very detailed description, none of which I gave in the book. I mean, she’s tall, she’s black, she wears this and that. But this woman actually recognized her in a dream, which means she put her own characteristics into this fictional person. The woman had no confusion: maybe she was somebody else? How’d she know she was Pilate? That is the kind of thing I really like in a reader. MR: Does it make a difference to you whether someone listens to your work or reads it in print? TM: I sort of emphasize the book, myself. I prefer to think that readers don’t really need to hear the book being read by me or anybody, but I’m perfectly happy when they do. It’s really hard, I’m talking about sound as I hear it from the printed page and then my conviction about what it ought to sound like in the audio book. I don’t know, this may not be a good comparison, but it’s like music to me, in a sense that, I suppose, a really good musician can read music, a score, and hear it — I mean, I can’t, but musicians can sit there and they can translate the notes into sound, and then later on they sort of, you know, they play it. I think a lot of it is just my background growing up in a household of people, of adults, who told stories for entertainment, and repeated them for entertainment. Funny stories, mostly ghost stories. But the interesting thing was that at some point they would ask us to tell those stories, the same stories: “Tell that story about…” and we would do it. And they encouraged us to alter it, I mean not the plot, but we could put in our own style in order to emphasize something. A lot of them were rhymes within the story, and they were all sort of violent, but [laughs] all children’s stories were violent: “Rock-a-bye Baby,” plague stories, “Ring around the Rosie,” all that. Anyway, I’m also a radio child, because there were these stories on the radio, about fifteen minutes long, and I would lean in, I was always curious: “Don’t put your ear up against the speakers,” my mother would say. And the thing is, if somebody on the radio says, “She wore a blue dress,” I have to pick out the blue shade, I have to actively participate in that reading, in that story, as being told on the radio. If they say “rain,” I mean I have to see that, or I do see it, so that that relationship is paramount. There’s a lot of withholding of information, though not outrageously, but certain withholding of information or placement of it. So I just really want this relationship between the text and/or the audio with the reader. I don’t like the distance that sometimes exists. You know where you’re simply absorbing the information? I want the reader to participate in it. MR: You’ve talked in previous interviews about how your novels relate to oral traditions of African American communities, and you’ve just spoken about growing up telling stories and listening to the radio. Do your audiobooks relate to these oral traditions as well? TM: They probably do. I’ve always said that African Americans didn’t need novels for a long time — not that they necessarily could write them. They had autobiographies of Frederick Douglass for example, tales of being enslaved, and so on — but not fiction. And I thought the reason they didn’t read it or it wasn’t important was because of the music that they had, and the stories they told, which was the cultural transmission of life. And then there was a moment when that didn’t work, when the music belonged to everybody. Jazz and so on. It might have originated with African Americans, but it was distributed by others. I’ve heard some of the best jazz in Japan, so it was not culturally limited to, say, African Americans. I thought that literature, then, really ought to exist, but I didn’t want to do the sort of writing that was very popular in the so-called Harlem Renaissance, back in the nineteen-twenties, which was sort of racial uplift. I didn’t want to do that. I don’t mean that it shouldn’t have uplifted the race. But those books implied a white reader, which implied a white gaze, so that there was always some white critic or eye looking over your shoulder, for Ralph Ellison and others, which was appropriate since they were trying to address the oppressors, so to speak. I didn’t want to do that. I could care less. MR: People feel very strongly about matching an audiobook’s narrator to the subject matter, especially in terms of gender, race, or ethnicity. For example, some think that a novel about an African American character should have an African American narrator. Did you have any say or strong feelings about who narrated your audiobooks? TM: No, I didn’t know who they had picked. I just signed the licenses, and I guess the publisher thought it would be good to get a black actor, like Lynne Thigpen or Alfre Woodard, to do it. You know what’s interesting though? I’ve done audiobooks, or permitted one book, I think Home, to be done as an audiobook in France. The reader is an actress, who is extremely good — I’ve heard her, I met her, and she has kind of a low voice, like mine. I heard from the editor a couple of weeks ago that the translation of the book, as it’s read by this woman [Anna Mouglalis] in French, is selling like hotcakes. So the editor asked me whether I would let this woman do all the others, and I said of course. I mean, that’s a whole new thing for me to hear. I don’t think the audiobook’s jumped off in Europe the way it has here, but it certainly looks like it’s going to jump off, since the audiobook of this French actress’s reading has sold incredibly well. It means that not only is it not necessary to have an African American read my book, but she could be white and she could be European, and do it also. MR: I just have one more question for you. I think of your books as formally complex since, among other things, they have lyrical passages that look like poetry on the page. Do you try to draw attention to the novel’s form when you’re reading aloud? A PDF copy of this interview can be downloaded here: Toni Morrison Audiobooks Interview.